This is a simple Christmas card that I made with Lili of the Valleys James-Christmas Tree. I watercolored him with Distressed Inks and added Shabby White Frantage to the background. I had just received my 7 Kids College Fund order and all the dies were in it! OH was I a happy die cutting girl! 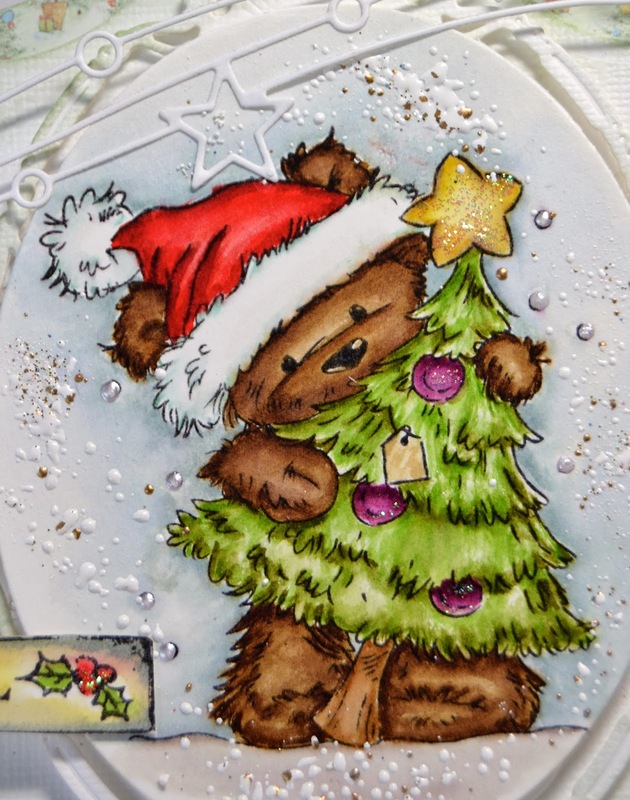 I used a Go-Create die for the base and Majestic Opulent Ovals from Spellbinders to frame James the bear. Can you see the sparkle of glitter glue on the bulbs, star and holly? It barely shows on the photo but they added some elegance to the card. On top is my Memory Box die Star Flourish, I really love the whimsy of this die. On the sides I cut in half the Memory Box Die Sussex Snowflake so that it would show on each side of my image. 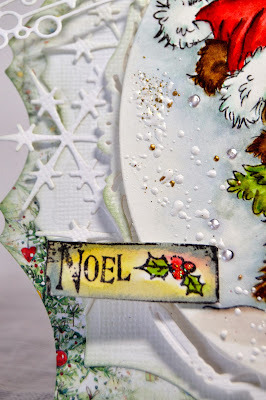 Noel is from Lili of the Valley and colored with Distressed Inks. Here is a side view of my card. I used a sheet from Annabelles Christmas 6x6 pad for a soft touch of color. I like the simplicity of this card for mailing, cheap! Thank you for visiting me today and I hope your day is going well! WOW ! this card is wonderful, so nice colouring, the shape is superb, love all ! Love, love this card, Kelly! You did a superb job coloring the cute bear. Love the shape and the beautiful die cuts! Such a little cutie.....beautifully coloured.....and created, Kelly! What lovely layers, textures and colors! James is a real cutie pie too! Those dies are so beautiful and delicate! You have done another fabulous job. Love it all! This is beautiful Kelly I love the image and the dies are gorgeous. The coloured image against the white embellies is very striking. 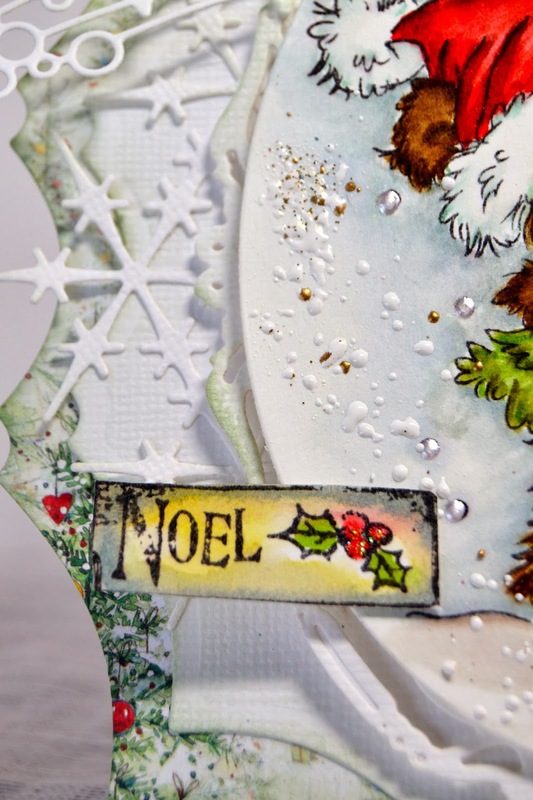 What die have you used to create the base of the card - love it. Nearly Friday so I can wish you a happy weekend. Absolutely beautiful! Love those dies! They are the perfect touch! So cute and on a beautifully shaped card. Now I really love this Kelly - makes me smile!! The Frantage really helps with the Christmas feeling!! What fabulous dies, and you've used them so beautifully. Fantastically shaped card, and what an adorable image, with all your amazing colouring skills on display. This is so pretty. I love the image, the lovely colouring, the layout, shape and design - it's all so perfect and gorgeous! I love this card! The bear is just too adorable.